A Mount Sinai New York practice, at Mount Sinai Doctors Palm Beach, we are committed to bringing leading-edge medicine provided by highly skilled doctors to your local community. As a new, multispecialty practice we are pleased to offer state-of-the-art equipment and advanced treatments in cardiology, endocrinology, gastroenterology, ophthalmology, and primary care. Cardiology patients can also visit our office on University Boulevard in Jupiter. 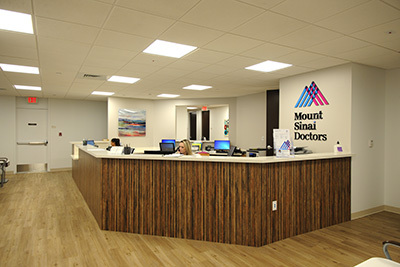 Our patients also benefit from access to world-renowned specialists at the Mount Sinai Health System in New York. By combining multiple specialties together under one roof, our doctors work closely to coordinate each patient’s treatment plan and provide seamless continuity of care. Our highly trained staff makes scheduling easy by offering same-day and next-day appointments, accepting most insurance plans and all payment types, and keeping wait times as short as possible. Our fresh, new offices are bright and comfortable. For your convenience, valet parking is offered along with an attached garage. Our dedicated team strives to build a long-term relationship with each of our patients and families. During your office visit we make time to give you the individual attention you deserve and answer all your questions. Physicians are available on call 24/7 to address any urgent concerns you may have. Through this combination of compassionate attention, convenience, and cutting-edge medicine, the specialists and staff of Mount Sinai Doctors Palm Beach are committed to providing the personalized care our patients need to enjoy life to the fullest.